Discover how seeds travel from place to place. Our narrator excitedly tells us how she saw a pear fall from a tree in the meadow and how a cow came along and ate it. Then the seed began a journey. Where would the seed end up? Would it grow into a big tree with pears of its own? Using the pear and cow example we can stimulate more questions about seed dispersal and, like all the books in MUMMY NATURE series, Travelling Seeds can be used as a jumping off point for discussion of other topics such as seed germination, plant parts or how plants animals and people interact in nature. On the last page we can see more examples of ways that seeds can be spread. Each book in the series is one mini nature lesson wrapped up in colour and rhyme. These books are intended for very young children including toddlers and will give them just a glimpse into some of the wonders of the natural world. Illustrated for maximum vibrancy and visual impact, using rhyme to engage young minds and encourage participation. Read the rhymes to your children and soon they will be reading them to you! The narrator is a small child and keen observer who tells us in short rhyming phrases everything she thinks we should know, and all about the magical things she sees around her. Sometimes she is camouflaged in the long grass and other times she has to climb a tree to get a better look. A lovely, colourful, rhyming picture book with an educational theme. A wonderful teaching resource for play schools and infant classrooms. I would recommend Travelling Seeds as a stimulus for introducing living things and the plants and animals strand of the SESE curriculum for the junior and senior infant classes. The book provides a simple basis for a discussion about living things and how we can tell if something is living or non living. Children find it difficult to grasp the concept that plants can move but Travelling Seeds depicts and explains this in a very simple way for children to understand. 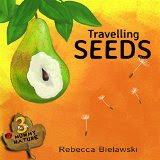 When I read Travelling Seeds to a group of children they were fascinated by the information contained in the short book and they enjoyed the rhyming nature as well as the beautiful illustrations. Some discussion about cow dung and manure ensued after some children took exception to the word 'poop' in the story.